Aerotech’s AMG LP (Low Profile) gimbals provide precise angular position, rate and acceleration for development and testing in space-constrained applications. Direct-drive allows significantly higher speeds/accelerations than competing products. Ideal for directing optics, lasers, antennas, and sensors at high speed to precise pointing angles. Applications include missile seeker test/calibration, electro-optic sensor/FLIR testing, optical testing of sensors in vacuum, and angular testing of gyros, MEMS and accelerometers. Aerotech’s AMG-LP (Low Profile) position and rate gimbal mounts provide ultra-precise angular position, rate, and acceleration for development and production testing of a wide range of systems. The AMG-LP series is ideal for directing optics, lasers, antennas, and sensors at high speed to precise pointing angles. Typical applications include missile seeker test and calibration, electro-optical sensor and FLIR testing, optical testing of sensors in a vacuum, and angular testing of inertial sensors such as gyros, MEMS, and accelerometers. The AMG-LP gimbal provides high performance at an affordable price. The finest quality motors, bearings, and encoders are integrated into precision-machined housings to ensure peak performance. By incorporating our low-profile direct-drive rotary stages, the AMG-LP series is capable of speeds and accelerations that are significantly higher than other competing products of this size. These gimbals have a lower profile compared to competing products within given torque ranges. This results in a smaller and more effective gimbal for many applications where beam height and chamber volume are of utmost concern. Direct-drive brushless torque motors, with rare-earth magnets and high-accuracy angular transducers are coupled directly to precision shafts for accurate and smooth 360° continuous motion. The absence of gear trains and other drive mechanisms eliminates position error contributions due to mechanical hysteresis and backlash. Directly-coupled high-resolution position feedback devices ensure highly accurate and repeatable positioning. A wide range of performance feedback grades is available. Typical line gimbal resolution ranges from 0.87 to 0.32 µrad with Aerotech controls. A built-in azimuth slip ring provides for continuous rotation with no cable wrap-up. 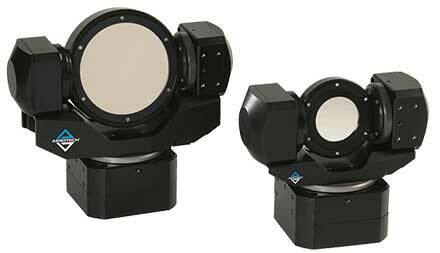 A variety of mirror cell diameters are available for standard optic applications. We also provide for custom payload attachment solutions for various device interfaces. Each gimbal mirror cell can be modified or replaced with different shaped cells to accommodate sensors or other odd shaped payloads. To maximize positioning and velocity performance, AMG-LP gimbal mounts utilize Aerotech’s high torque S-series brushless, slotless servomotors. These motors have all of the advantages of a brushless direct-drive motor — no brushes to wear, no gear trains to maintain, high acceleration, and high speeds. Since it is a slotless, ironless design, there is zero cogging, meaning there is absolutely no torque ripple. This results in smoother motion throughout travel and more precise positioning. These motors are available in different winding configurations to work with high- or low-voltage power supplies.